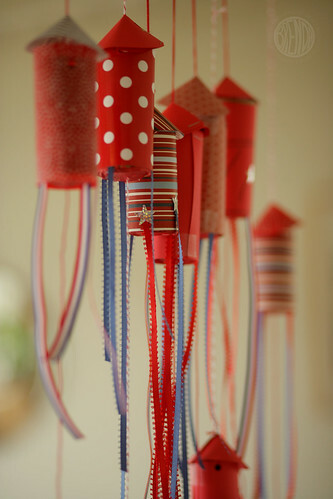 Juneberry Lane: Bonus Tutorial: Hanging Confetti Firework Poppers . . . 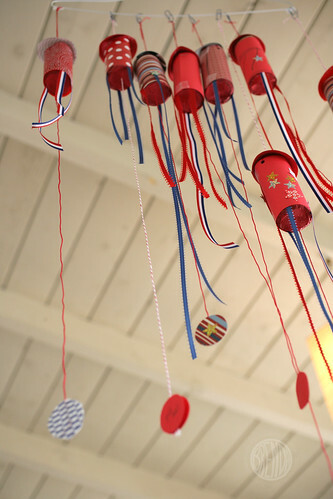 Bonus Tutorial: Hanging Confetti Firework Poppers . . . Since the big day is almost here and most of you will be spending the weekend making your plans for the 4th and getting ready for those picnics & BBQs, I thought I would send you into the weekend with this fun little bonus tutorial that is sure to bring delight to your entire family. 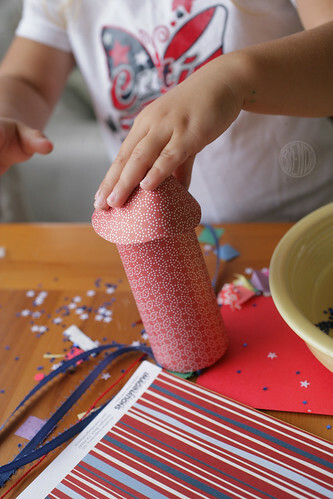 Everyone knows this holiday is all about big bangs, pops, and firecrackers, so why not add to the fun with these festive & adorable confetti firework poppers. I just adore their retro vibe too, and a good-looking decoration that becomes a shower of fun confetti is hard to beat. Here's how it's done . . .
Now to build it! First you will build the “propulsion system.” Of course this rocket isn’t really going to take off and fly around the room but the confetti is housed where a normal propulsion system would be so we call it that. 1.) Cut yourself a small square of tissue paper that will be big enough to cover the bottom of your cardboard tube–about three inches across. 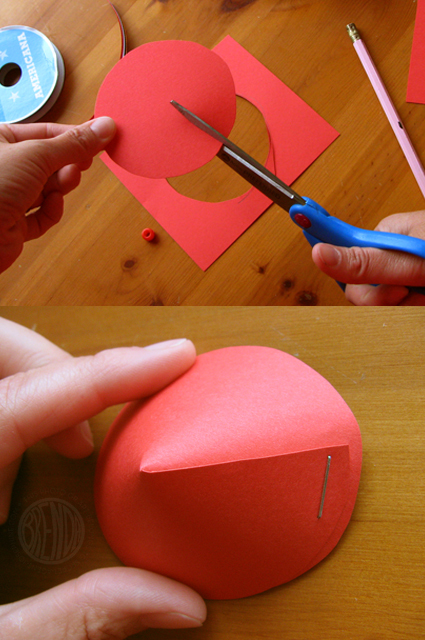 Cut a small disc out of a sheet of card stock that will fit just within the radius of the cardboard tube. 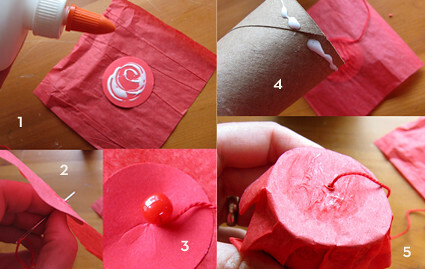 With some glue attach this disc to the center of your tissue paper. Let it dry for a few minutes. 2.) Thread about an arm’s length of twine onto your craft needle and tie a bead to the end with a knot. 3.) 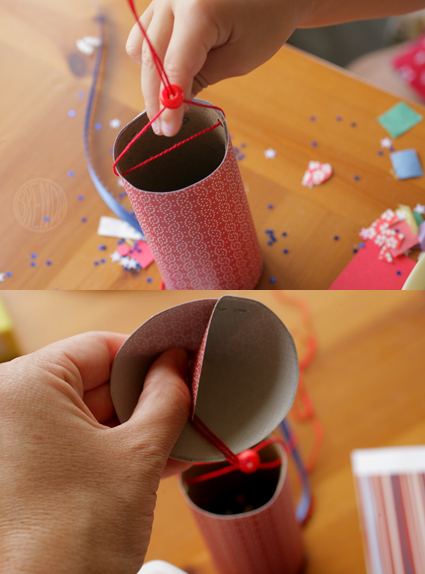 Poke your craft needle through the center of the paper disk and tissue paper square and pull the twine through so that your bead is pressed up to the side of the paper circle. 4.) Next you will need to glue this tissue paper trap door to your cardboard tube with a small line of glue around the bottom of the tube. 5.) 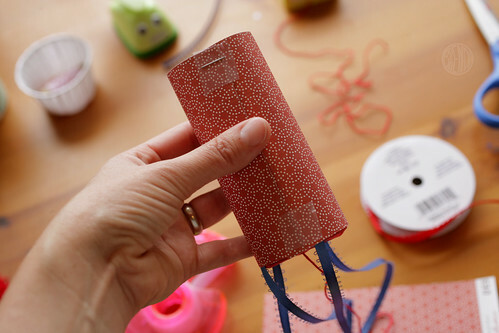 Make sure you attach it with the bead side inside the tube and the string (or fuse) side hanging outside of your tube. You can add a pull tab to your long dangling fuse or just let it hang. We added stars to some of ours. Let this dry and you’re done with that part! Now onto decorating . . . 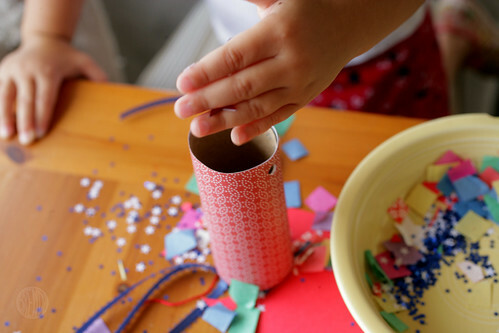 There are lots of ways you can decorate your rocket but the most important part is to cover the tube with some decorative paper so that you don’t see that it used to be a toilet paper roll (or paper towel tube). This decorative sheet (roughly 6.5×4.25 inches big, depending on your tube) also holds your tissue paper trap door on, or at least covers the ruffles of tissue where it is glued to the tube. We attached ribbons to the bottom inside of our decorative covering so that the rockets looked like they were flying–or just pretty and festive. 6.) 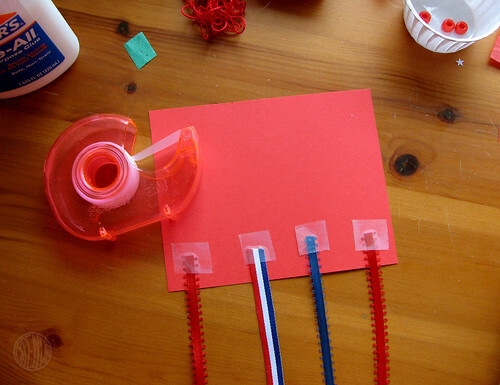 Roll your paper around the tube and staple at the top for strength. You can’t staple the bottom because your tissue paper trap door keeps the stapler from getting inside but I found that a couple of pieces of tape did the trick. 7.) Now you can fill your tube with confetti. We just put in a few handfuls but feel free to load this sucker up. 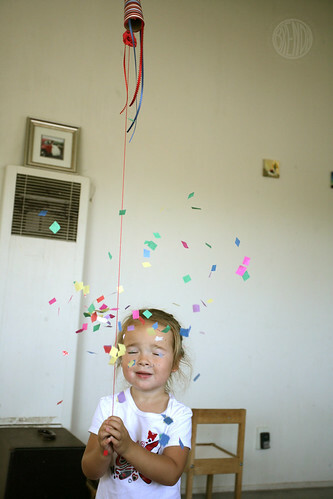 Just think about how much confetti you want to clean up later and act accordingly. I say the more the better but then I’m a bit of a free spirit who doesn’t mind a little mess for the sake of some good old fashioned American fun. 8.) Cut a circle about 3.25 inches wide across, then cut one snip all the way to the center of the disc like you see in the picture to the right. Take the edges of your cut and pull them together, probably about a half an inch or more. When your cone has reached a desirable height, staple it at the base. Now for the tricky part: attaching the cone to your rocket. The important thing here is creating a strong holder that you can use to hang your rocket from. Since these rockets will be tugged upon, it’s important that the rocket holds together and doesn’t come crashing down on your head instead of releasing it’s payload of confetti. I found the best way to hang these rockets was to put the string through two holes punched in the top of the rocket body, then thread the two sides of the string through a center bead (just to keep it centered) and up through the center of the cone so that it comes out of the point or top of the cone; as in this picture below . . .
Now you are all set! Hang them up & let the fun begin! 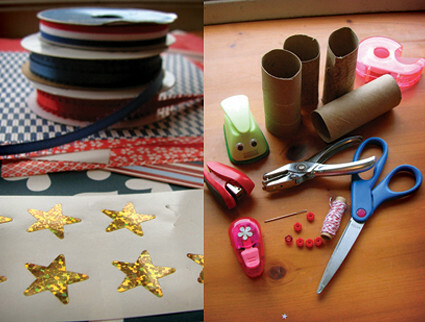 A sweet little project perfect for the upcoming holiday!